It was a bitter pill to swallow for a dedicated cage competitor like Burn “The Hitman” Soriano when he yielded to Malaysian sensation Saiful “The Vampire” Merican nearly ten months ago. Soriano suffered a first-round technical knockout loss to Merican at ONE: THRONE OF TIGERS in the Malaysian’s hometown of Kuala Lumpur this past February, failing to accomplish a follow-up victory to his scintillating 15-second knockout of Mario Satya Wirawan in August 2016. Although the thrilling bantamweight bout against Merican put fans at the iconic Stadium Negara on the edge of their seats, Soriano was left disappointed with the outcome of the match. “I believe that I could have done better in that match with Saiful Merican. I was prepared to go full three rounds, but I came up short. I just realized that there was something missing,” Soriano recalled. The stoppage loss to Merican forced Soriano to reassess on how he handles his training camp when he prepares for an upcoming bout. 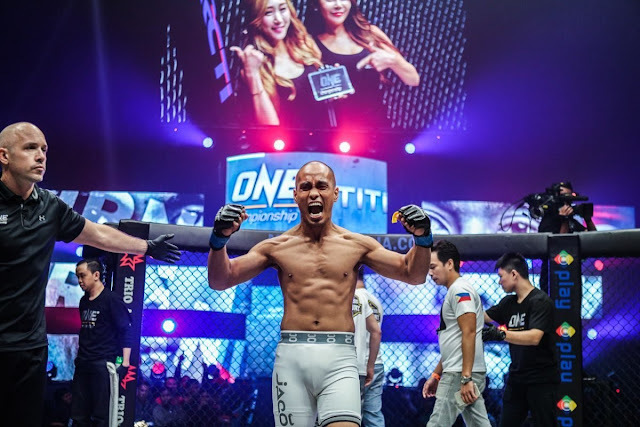 During his time of contemplation, Soriano found a much-needed help in George Castro, who is known as the man behind the renowned Alliance MMA’s strength and conditioning program. George Castro recently moved all the way from Tucson, Arizona, hundreds of miles across the Pacific to the tropical city of Manila to help ONE Heavyweight World Champion Brandon “The Truth” Vera set up the first Alliance MMA branch in the Philippines. Aside from training Vera, Castro has also worked extensively with several veterans of the sport, including Dominick Cruz, Ross Pearson, Jeremy Stephens and Chris Leben. “Right now, I have a tremendous support system in my training, especially with the help of my coach George Castro. He knows how to bring out the best in me. With him in my corner, it is always exciting to prepare for a bout,” Soriano said of Castro. The partnership between Soriano and Castro will be tested for the very first time as the Filipino combatant returns to action on 3 November to meet unbeaten Chinese prospect “Rock Man” Chen Lei. The two standouts are set to face each other on the undercard of ONE: HERO’S DREAM, which takes place at the Thuwunna Indoor Stadium in Yangon, Myanmar. Soriano sees his upcoming three-round bantamweight encounter with Chen as an opportunity to bring back the glimmer of his professional career. “I want to win so bad. I have dreams and aspirations as a competitor. In order to turn those into a reality, I have to win first. This is the first step,” he stated. Although his professional record stands at 3-3, Soriano has become one of the most exciting mixed martial artists in ONE Championship. None of his matches, regardless of sweet victory or disappointing defeat, have ever gone to the three judges’ scorecards. For Soriano, it is crucial to be an entertainer inside the cage and to put on a good show for fans all across the globe. Quite simply, the 31-year-old native of Ilocos Sur, Philippines wants spectators to feel like they have gotten their money’s worth. “It is very important for me to be entertaining. I take the risks. I want the crowd and fans to get what they want, which is an exciting fight,” he explained. “I just enjoy what I am doing. I am passionate about it. Everyone should go out and prove something to themselves and not to anyone or anybody else,” Soriano added. With the desire to reinsert his name into the winner’s column, Soriano is confident that his support system has geared him up splendidly for his marquee match-up with Chen at ONE: HERO’S DREAM. “My team is outstanding. I have the best coach in my corner. I also train with the most talented athletes in the region. With that said, I’m motivated and oozing with confidence coming into this bout because I have them behind me,” he ended.